they have an enormous church service in honor of St. Francis of Assisi. He is a very popular saint, since he is associated with love of nature and animals, self-sacrifice, and tender kindness for human suffering. Thousands of people come to celebrate and pray at this event on his Feast Day in early October, and the result is absolutely spine-tingling. The Cathedral holds several thousand people, and it is crammed full for the occasion. There is a specially convened choir of a hundred or more high school and college kids from all over the eastern US as well as a some international singers. And in addition, there is large group of instrumental musicians from all over the world; African drummers , Brazilian percussionists, and dancers everywhere. And beneath it all is the mighty, (and I mean MIGHTY) pipe organ of the cathedral, which, without any amplification whatsoever, can completely command the entire space when necessary. The enormous church is alive with the huge throng of people, many of whom have waited hours to get in. The Bishop of New York, along with dozens of other luminaries, processes through the aisles while the organ literally shakes the building and clouds of incense fill the air. Grandiose “High Church” at it’s most extravagant. But the best is yet to come. At the end of the service, when the last thunderous notes have finally evaporated into the air, the Bishop asks everyone to please be silent, and calls for the great bronze door of the cathedral to be opened–a rare and ceremonious event. A brilliant shaft of sunlight falls upon the center aisle, and there, silhouetted at first as they enter the quiet shadows of the cathedral, comes a procession of animals up the center aisle. Led by white-robed acolytes, they walk slowly toward the altar, while the crowd looks on in rapt silence. Camels, horses, sheep, eagles, llamas and cows, snakes and rabbits and many more, all walk with animal dignity down the aisle. A child pulls a little wagon, on which rides a tortoise who looks like he must be 300 years old. Behind him, a man in a wheelchair is escorted by his dog, who is clearly an indispensable partner in helping him to live his daily life. In the year 2001, St. Francis’ Day took place only a few weeks after the World Trade Center bombing, and the procession was led that year by the rescue dogs who had just been brought up from Ground Zero minutes before. Thousands of people burst into tears at the sight of them. As you can see, it’s not a joke. It’s a very powerful and solemn event. 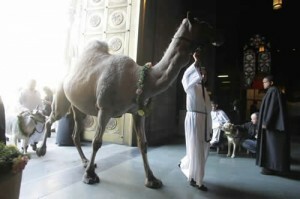 It is startling to see these animals walk into this massive, gilded cathedral as honored and revered guests. It makes you look at them in a very different way. It’s holy, crazy, bold, iconoclastic and funny all at the same time–and we all leave there transformed. Next Next post: Who’s there?